Data from Statistics Estonia show the cost of living was 3.1% higher in February 2018 than a year earlier, which is slightly less than the 3.5% recorded for January. Inflation remained subdued in the euro area at 1.2% in February, which is below the 2% target of the European Central Bank. 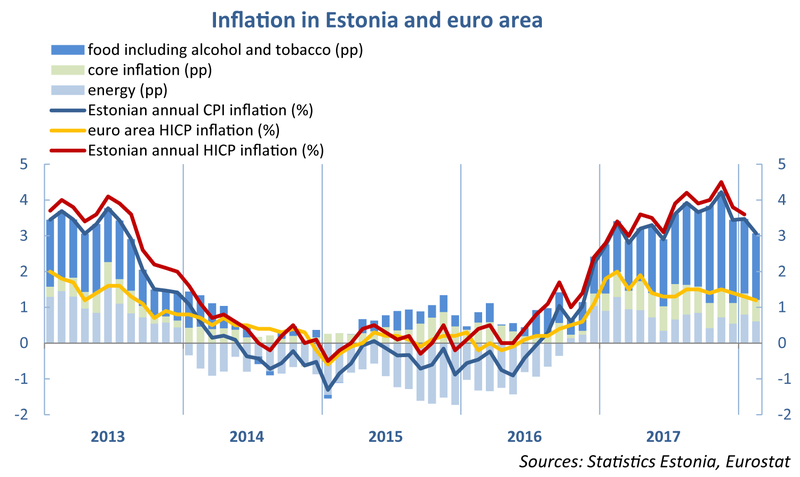 Inflation fell in Estonia in February mainly because of the higher reference base, as the largest increase in food prices came more than a year ago. Food price inflation on global markets has now slowed and lower prices for some food groups have now passed into consumer prices. The price of butter has fallen by 6% in three months for example. However, the rise in prices of fruit and vegetables, which are more expensive in the winter months for seasonal reasons, was larger than usual. The rise of 18% in fruit prices in Estonia was one of the largest in the European Union. The Estonian economy has grown exceptionally fast recently and the growth has been broadly based. It could be expected in consequence that inflation would be fairly even across groups of goods. However, the rise in consumer prices has again mainly been limited to higher prices for energy and food. Inflation for services and consumption goods was only 1% in February, though rising wages and company profits will probably start to raise those prices in the medium term. Inflation has been restrained to some degree by the recent strengthening of the euro against the US dollar. The overall consumer basket is forecast to rise in price by around 3% this year.